Not only does light cause discoloration of meat, it also contributes to increased growth of pathogens such as Listeria and Salmonella by raising the surface temperature of exposed products. Promolux® Safe Spectrum® lighting products are engineered to reduce the rates of growth of microbial pathogens compared to regular general lighting products. "...discoloration and spoilage cost the retail industry $1.1 billion in sales in 1991." The National Cattlemen's Beef Association reports that as much as one billion dollars of retail sales are lost annually by US grocers due to the premature discoloration of beef. Years of research by university Meat Science departments conclusively demonstrate the connection between lighting and meat discoloration. "Gary C. Smith, Ph.D., from Colorado State University, estimates discoloration and spoilage cost the retail industry $1.1 billion in sales in 1991." 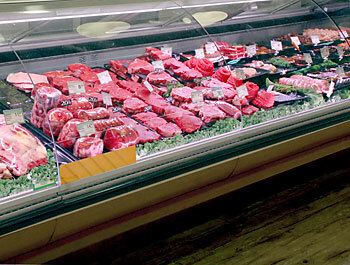 "Consumer studies have shown that physical appearance of a retail cut in the display case is the most important factor determining retail selection of meat products." "Consumers select meat cuts primarily for leanness and then for appearance and freshness, with judgments for the latter two attributes based primarily on brightness of color (ASPC, 1964; Rhodes et al., 1955; Seltzer, 1955). The importance of attractive lean color was further emphasized by Shaw (cited by Nelson, 1964), who reported that 36.7% of the meat purchases from self-service counters were unplanned and that these impulse purchases were made primarily because of attractive appearance." “The reports of other workers (Danner, 1959; Mize & Stringer, 1959; Marsh, 1958) [found] that colour was the most important selection criterion." "The fact that 41.9% of the consumers interviewed in the present study considered colour when making meat purchases substantiates that colour is one of the most important selection criteria." Molecular Genetics Could Shed New Light on Beef Spoilage. Frances Nattress and Chris Yost. Research Report CABIDF-52. Canada Alberta Beef Industry Development Fund, 1999. Read the whole article here.